Over the years the Scrumpy & Western website has amassed a small collection of audio clips by various bands. As well as scattering them across the website, here are all the clips gathered together to give you a small feast of Scrumpy & Western music. Note: all clips have been provided with the permission of the bands and record labels involved. They are for person use only, and not to be reproduced without permission. These clips are for demo purposes only; not for sale or public broadcast. All rights reserved. Unauthorised copying, reproductions, hiring, lending, public performance and broadcast prohibited. All rights remain with original copyright owners. Real Audio clips from the 2000/2001 compilation album The Finest 'Arvest Of The Wurzels featuring Adge Cutler. Sound extracts © EMI Records - not to be reproduced without permission. The following MP3 audio clips are taken from the live session that gave rise to The Mangledwurzels debut album Get Orf My Land! The Mangledwurzels Sampler - contains clips of six songs recorded live at the Charlton Inn, Shepton Mallet: Blackbird, Combine Harvester, Chitterlings, I Can Drive A Tractor, Scrumpy Jack, and I Am A Cider Drinker. Get Orf My Land! - available to hear in its entirety on The Mangledwurzels MySpace page. The Rat Song - available to hear in its entirety on The Mangledwurzels MySpace page. The 12 Days Of Christmas - available to hear in its entirety on The Mangledwurzels MySpace page. Santa's Coming To Somerset - available to hear in its entirety on The Mangledwurzels MySpace page. MP3 clips; exclusive to the Scrumpy & Western website! Sea Of Cowpats - from the Cutlers of Cornwall's 2008 album The Cutlers Of Cornwall - Behind Bars. High On A Hill - from the Cutlers of Cornwall's other 2008 album A Country Life. Cornish Lads - planned for inclusion on the Cutlers of Cornwall's 2009 album One and All. MP3 clip. Exclusive to the Scrumpy & Western website! Don't Ee Know! - from the Cornish Wurzells' 2007 album of the same name. 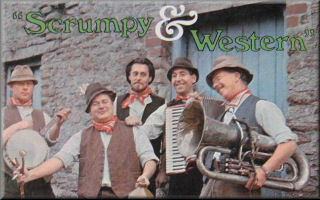 The Scrumpy & Western website is proud to present some exclusive sound clips of The Plonkers in action. These excerpts from some of their greatest performances are brought to you with the approval of The Plonkers themselves. All sounds are recorded in full Plonkerphonic sound and will require an mp3 player to 'ark at 'em.